While many in Congress and private sector economists embrace raising the $7.25 federal minimum wage where it’s been frozen in place for a decade, few speak out about reducing immigration as a permanent income-boosting cure. The academic exercise is basic – the more available workers, the better for employers. Conversely, tighten the labor pool, then advantage shifts to workers and job seekers. Recently, the House Education and Labor Committee passed the Raise the Wage Act which would, if it became law, gradually raise the federal minimum wage over five years to $15 an hour. 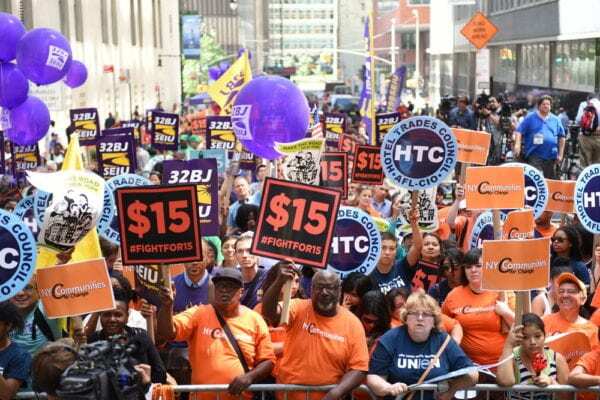 So far, six states – California, Illinois, Maryland, Massachusetts, New Jersey and New York – and the District of Columbia have adopted $15 as their minimum wage. Although not enough data is available to make a final conclusion about the $15 wage’s broad effects, Georgetown University public policy professor and former Clinton administration Labor Department economist Harry Holzer predicts significant job losses that would hurt low-skilled, less-educated minority employees who would resort to accepting cash off the books, and thereby forfeit any benefits they may have had. Last week, the Trump administration announced that 30,000 more H-2B visas for low-skill seasonal workers – in landscaping, leisure, and seafood – have been approved, thus increasing the annual authorized H-2B total from 66,000 to 96,000. That’s nearly 100,000 jobs that Americans would do yet won’t be able to compete for. The H-2B visa hike represents a big win for employers, but also shows the continued congressional abandonment of U.S. workers. This entry was posted in Employment and Immigration, Immigration News and tagged h-2b, immigration, minimum wage, raise the wage act, restaurant jobs.